a kind of joy from that. Where the center of your gravity lies. They disappear and reappear in reality. They appear, and then they disappear. Consciousness Moves to Another Universe After Death. of the constraints of Time and Space. in the Human body and outside of it. in several, sometimes countless, ways. the less time they exist. Outside of the constraints of Time. of which you are made. about whether particles even exists. the origin of all structure today. Feel the Earth in your toes. Rise before the Morning Light. Let your Soul take its flight. Meditate on the Beauty of our Universe. This year, more than 1 million Americans and more than 10 million people worldwide are expected to be diagnosed with cancer, a disease commonly believed to be preventable. Only 5–10% of all cancer cases can be attributed to genetic defects, whereas the remaining 90–95% have their roots in the environment and lifestyle. The lifestyle factors include cigarette smoking, diet (fried foods, red meat), alcohol, sun exposure, environmental pollutants, infections, stress, obesity, and physical inactivity. The evidence indicates that of all cancer-related deaths, almost 25–30% are due to tobacco, as many as 30–35% are linked to diet, about 15–20% are due to infections, and the remaining percentage are due to other factors like radiation, stress, physical activity, environmental pollutants etc. Cancer is a staggering epidemic. 1. All charred food, which create heterocyclic aromatic amines, known carcinogens. Even dark toast is suspect. 2. Well-done red meat. Medium or rare is better, little or no red meat is best. Be healthy. – Be LOVING. 4. Heavily salted, smoked and pickled foods, which lead to higher rates of stomach cancer. – beverages and foods that provide vitamins, minerals and other nutrients. 6. 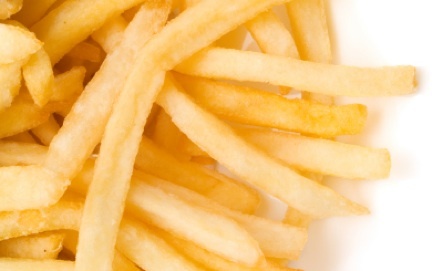 French fries, chips and snack foods that contain trans fats. 7. Food and drink additives such as aspartame. 9. Baked goods, for the acrylamide. 10. Farmed fish, which contains higher levels of toxins such as PCBs. 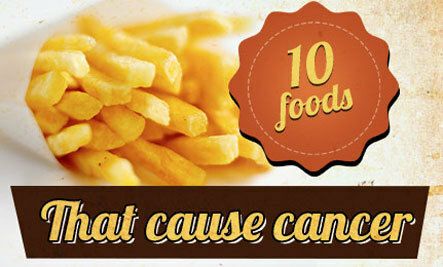 Top 10 Foods and Drinks for Cancer Prevention.